There are many options available when choosing compost bins. No matter what you choose, successful composting depends on using the right ingredients and providing proper air circulation and consistent moisture. Really, no structures are needed at all for successful composting. If you create a pile of yard waste at least three feet high and three feet wide on each side, the material will compost readily on its own. Composting is faster if the heap is turned regularly. This method is not very tidy, but it is free! You can construct an inexpensive compost bin out of wood pallets, chicken wire, or bricks. The bin should have open slats or ventilation holes on the sides to let in air. If you compost a lot of waste, you may want to construct a two- or three-bin system. This allows you to keep finished compost in one bin while building a new pile in another. You can find directions for building compost bins here. You can purchase simple compost bins made of four posts and plastic-covered wire. These are easy to move from one location to another and can be folded up for storage. If you're short on space or just want a compact bin that is covered, you can purchase a plastic compost bin. These are usually made from durable recycled plastic and feature lids, air vents, and bottom doors to shovel out finished compost. Plastic bins are often available at low-cost sales events sponsored by municipalities. Check to see if they're available in your area. Compost tumblers are another option. These bins rotate to quickly aerate and heat up the contents, so you can have finished compost in only a matter of weeks. It is important to rotate the bins on a regular schedule. 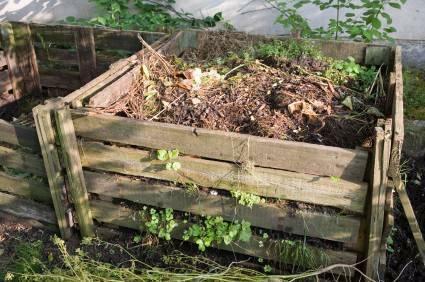 You should put your compost bins in a spot of your yard that is somewhat hidden but easily accessible. Be sure there is adequate air circulation around the bin. Keep it out of full sun to avoid excessive heat build-up. It is also handy to keep a pail with a lid near your kitchen door for storing kitchen scraps that will later be added to the compost bins. Composting can be a lot of work, depending on whether you choose a tumbler-style bin or plan to turn your pile yourself. Either way, you can save a lot of money on garden fertilizer when you make your own compost!